Most handmade businesses owners don’t check or follow the legal steps they must take when they start selling their crafts. It begins as a hobby, sewing bags, making some jewelry, knitting a few scarves, etc. and then the idea comes along that money can be made selling these crafts. The crafter signs up for their first craft show and starts building stock. But even sole proprietors, running their business out of their home, selling at small craft fairs must have certain licenses and permits. Craft show organizers typically don’t check that each vendor has followed the legal steps to set up their business properly, so who’s governing your new business and ensuring you’re following all the laws? There are legal hoops every business must jump through but typically no one forcing you to jump through them. Which is all fine and dandy until you get caught and have big fines to pay or limited time to jump through hoops that normally require a lot of time to jump through. If you’re a business owner, it’s your responsibility to understand and stay up to date with the laws in the jurisdiction(s) you operate your business. Pleading ignorance and claiming you didn’t know about the laws you’re breaking will not suffice. The information contained in this article is given as general legal information, and does not consist of legal advice. The information herein is provided by non-lawyers without any legal representations; it is not an alternative to obtaining legal advice, and should not be treated as such. If you have specific questions regarding a legal matter, you are urged to contact an attorney or other professional legal service provider. Nothing contained in this article will act to limit our liability in any way. When I started my handmade business selling handbags, I dove right in without doing my research. I didn’t register my business’ trade name at first and when I finally got around to it, I realized another business had the same name. Some jurisdictions will allow sole proprietors using a trade name (also known as a DBA, Doing Business As, Fictitious Name) to operate without registration but in most cases, you must register your business or your business name. You must first decide on a business structure. Which will determine how you pay your taxes, whether you’ll be personally liable in the case of a lawsuit and if and how you register your business. If you’re selling an item that has a higher risk of attracting a lawsuit, you may want to choose a business structure with limited liability. For example, if you sell handmade lotion or baby teething necklaces and the lotion causes a rash that racks up doctor bills or the necklace causes a choking hazard, a customer may sue your business. If your business is set up as a sole proprietorship or general partnership, it has unlimited liability. Which means your personal assets (e.g. car, house, etc.) may be at risk and used to pay damages. There are strict regulations that must be followed, which are in place to protect the consumer. Most products have some type of regulation to follow from the labels you put on textiles and how you package your boxes of cards, to safety regulations that must be followed for children’s products, soap, food & drink, etc. These regulations can be complex and vary by location. If you’re sending your products to another country, you also must be aware of their laws and ensure your products follow them. Intellectual property relates to the creations of the mind and is protected by trademarks, copyrights and patents. Trademark applies to creative works such as your business name, tagline, logo, etc. Copyright applies to the creative works you make and sell such as jewelry, pictures you paint, blog posts you write, etc. Patent applies to inventions, new processes you come up with for manufacturing, etc. As soon as someone creates something in a tangible form, it’s protected and doesn’t require registration. But registering a trademark, copyright or patent makes it easier to prove ownership and provides better protection. It’s also protected on a first-come, first-served basis. That means; you can’t just pick a business name out of a hat. Sure, it may not be registered as a trade name, LLC or corporation in your state/province but if it’s trademarked federally, you’re likely not allowed to use it. A registry office doesn’t always check federally registered trademarks or trademarks that are registered in other countries. So if you plan to sell to customers outside of your country, you must do a thorough search. That also means team logos, Disney characters, quotes, photos taken by someone else, etc. can’t be used in your products (unless they fall under “fair use”, “public domain” or you’ve purchased a licensing agreement). So why are there so many shops on Etsy selling Disney, Hello Kitty, Game of Thrones, New York Yankees themed products or “inspired by” Pandora, etc.? It does NOT mean it’s legal just because other Etsy sellers are doing it. It likely means they haven’t been caught yet. A part-time crafter selling crocheted Disney characters likely hasn’t purchased the expensive licensing agreement required to legally recreate the character, or use the licensed Disney-themed fabric for anything other than personal use. Your business may or may not be required to charge sales tax but every business is required to pay income tax. Even if you take a loss (i.e. you spend more on your business than your business makes), in most cases, you’re still required to report your losses on your income tax report. How you structure your business will determine whether you file that income with your personal taxes or using a corporation tax form. A lot of business owners don’t properly track expenses or income. And those numbers aren’t something you can roughly calculate for tax forms. The more business expenses you track the more you can lower the income total you must pay taxes on. You’re also responsible for charging the proper sales tax (if required to charge sales tax on your goods). US sellers shipping products outside their state must be aware of whether they’re in a origin-based state or destination-based state, which determines whether they charge the sales tax rate of the business’ state or the customers’. As well as whether their business has a nexus in another state. It’s also important to be aware of tax laws in jurisdictions you sell your goods. For example, if you live in the US but a large portion of your sales come from Australia, you may be required to register for GST with the Australian Taxation Office, charge GST on low value imported goods and lodge and pay GST to the ATO. Don’t get panicked. The legal aspect of running your business can feel overwhelming at first, but to get set up properly, you just need to take it one step at a time. 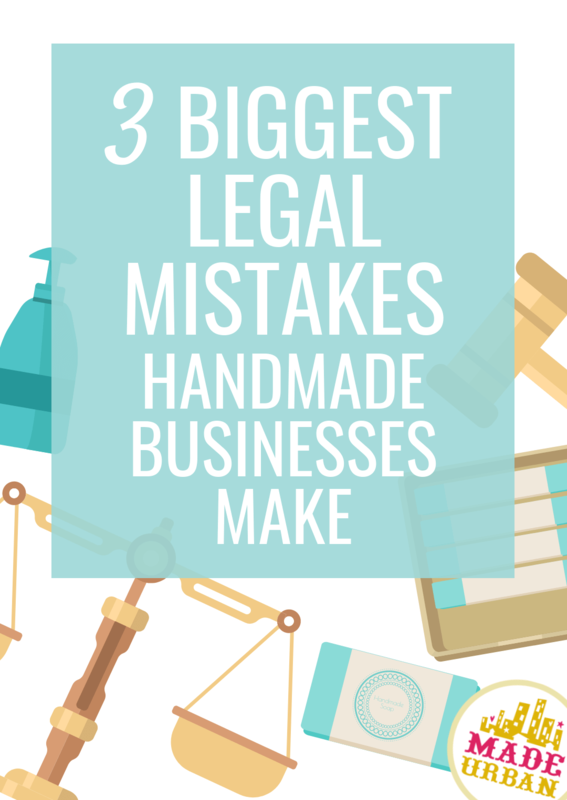 These are 3 legal mistakes crafters tend to make but there are other areas businesses must address. Download the free checklist to get an overview of the tasks involved in properly setting up a small business. If there are any tasks on the list you’re not sure apply to your business, or how they apply, take the time to research them. Your government’s website is the best place to start, as laws vary based on where you live (and where you conduct business; important if you ship your products out of country). 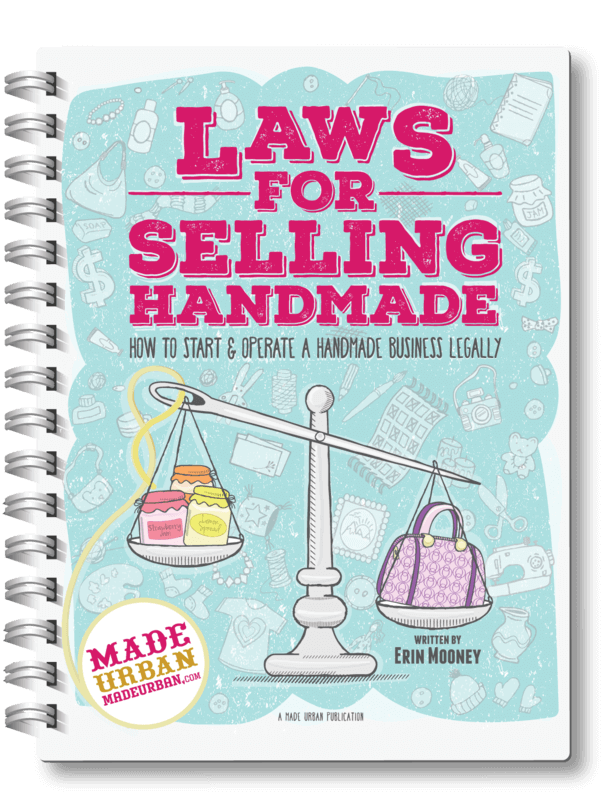 If you’d like a little more guidance to walk you through each step and gain a better understanding of what it means and why it matters to your business, consider downloading LAWS FOR SELLING HANDMADE. The language used on my government’s website and the way it was laid out, made my head spin. Which is why I wrote LAWS FOR SELLING HANDMADE in an easy to understand style, with easy to follow steps. Only take on one task at a time and slowly work your way through the list. Also, be open to changes…as they may need to happen. If you’ve been using a business name that a similar business in your jurisdiction is already using and has registered, you may need to change your business name. Don’t take it as a sign you should quit; just that you need to change directions. You’ll end up with a name that’s a better fit for your business, have an opportunity to re-brand and can even get your existing customers involved by asking them for name suggestions or to vote on their favorite name. If you’ve been selling Disney characters and have now realized it’s likely copyright infringement, look at it as an opportunity to refine your product selection (I’ve got lots of articles to help with that; the BEAT LAST YEAR’S SALES challenge is a good place to start) and use your creativity to come up with your own characters. I can help you get started with a few items on your list by gaining a better understanding of whether or not you must register your business, need a license, or insurance. Please read: DO I NEED A BUSINESS LICENSE TO SELL HANDMADE ITEMS? This article was put on your path for a reason and was the first small step to take…and it wasn’t too painful was it? Keep the momentum going and take the next small step…and then the next…and the next, and before you know it, you’ll have the peace of mind that comes with a business following all the legal rules. HAD ENOUGH OF LAW STUFF FOR NOW? Share in the comments if you have questions about your specific business. Someone with a similar business may be able to help you out. Government laws are not something to brush off. If you ignore laws such as paying your taxes, you’ll have more fees to deal with and likely even bigger consequences, such as having your passport revoked. When it comes to intellectual property, it’s a matter of respecting other business’ hard work and making sure you’re not infringing on it. If another business finds that you’ve been intentionally or un-intentionally copying their work, or using their business name and profiting from it, they’ll likely file a lawsuit against your business. And if your business isn’t set up properly, it may mean they can go after your personal assets to recoup their losses, not just your business assets. Whether you agree with the way the government operates or not, it’s good business practice to follow the rules they’ve set out. I have been using a business name since 1996 for my VERY small business but have never registered it. If someone else has decided to use this for their business name, what are the possibilities for me and what do I need to do to protect myself.